Me parece como estaba ayer, pero fue hace veinte años que estudió español con Consuelo España en Cabrillo College y aprendí algo del calendario de los Mayas. I took Spanish 29 at Cabrillo College in the Fall of 1991. The course was called "La Cultura y Civilizacion de Mexico," and was taught totally in Spanish. A research project was assigned, and I was told to research (totalmente en español, claro) the Mayan system of numbers (and the Mayan calendar). 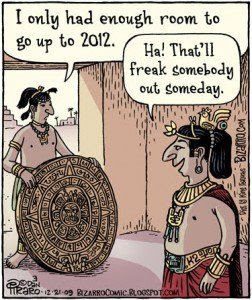 I wrote a report, and made a class presentation, and I have gone back into my filing cabinets to pull out the materials from my class, to see if these materials reveal why I have been "freaked out" about the end of the Mayan calendar (in 2012) ever since this class at Cabrillo. Unfortunately, my papers were not that revealing.